Ask about our comprehensive solutions spanning the entire logistics chain, from collecting your goods to delivery at their final destination. Outsource your company’s logistics services and reduce costs. Discover our warehousing solutions and bonded warehouses. Get a comprehensive logistics solution for your import and export operations, including warehousing in our bonded warehouse and the distribution of your goods. We collect your goods and take them to our bonded warehouse to carry out the relevant customs procedures. We prepare the shipment either as a full load or groupage. We handle international haulage, shipping and air freight, based on your needs and those of your shipments. We deal with customs procedures through our network of customs agents. We transport your goods to their final destination. We have our own warehouses in Spain, Mexico, Portugal and Alger to provide our customers with one seamless business and operations solution for their entire logistics chain. We are authorised by the customs authority to act as customs warehouses for various different procedures. You can store your goods and withdraw them when you need them and you will only have to pay tax when they are cleared at customs. This gives you a general warehouse and bonded warehouse in one place. We are also authorized to receive and store merchandise as an import warehouse, requiring only the payment of taxes after customs clearance. Regarding exports, we are authorized by customs to act as a customs export deposit (DME). With this authorization, it is possible to receive and store goods from one or several suppliers and proceed to the cargo consolidation for export. You will have your own agent, who knows exactly what you need for your projects and can offer you a customised service whenever required. We solve your problems of lack of space and stock control with the added value of being a bonded warehouse. By outsourcing your logistics services, you will be free to concentrate on your business whilst we take care of issues such as warehousing and distribution. This will enable you to reduce your logistics costs as we provide the warehouse, any equipment and machinery you may need, and the staff. Perfect for storing all kinds of goods that are not subject to any health, safety or security regulations with all the guarantees of a comprehensive service covering the entire logistics chain. By law, when healthcare, medical and cosmetic products are imported they must be stored in a suitably authorised warehouse, approved by the Spanish Medicines and Medical Product Agency. These warehouses can be used to store all kinds of products, such as medical and surgical equipment, and orthopaedic products. This differs from the healthcare and medical product warehouse. 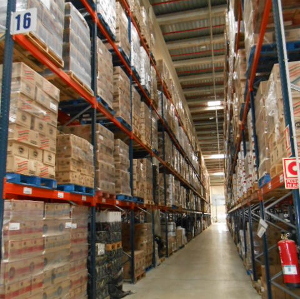 Our food registered warehouse is certified by the Spanish Ministry of Health to store products for human consumption, as long as they are packed and can be kept at room temperature, such as snacks, packaged bakery products and biscuits. Bonded warehouses (public or private): where your goods can remain indefinitely awaiting their final destination. VAT warehouses: for EU goods or for those coming under the free circulation procedure. Temporary storage facility: where the goods can be stored for up to 90 days. This is a more interesting option for temporarily importing goods and then re-exporting them. Authorised facility for expor goods: included in the temporary storage facility since the new Customs Code came into force. Tax warehouse: for alcoholic drinks that are subject to excise duty. We offer this service in our Drinks Division which is specialised in wine and liquor logistics. We can distribute your goods as a full load or groupage. We also offer a small parcel service. We give you the necessary tools so you can access your stock in our warehouses online. Customised comprehensive logistics solutions, from production to distribution to the point of sale. We take care of all the stages in the logistics chain with a sole operator, saving time and money. National and international distribution plans. If you would like to have a work area near your goods in our warehouses, we rent out office space in our logistics platforms in Ribarroja (Valencia) and Coslada (Madrid), which have their own independent access, electricity, telephone and data facilities. They have heating and air conditioning, and are covered by the excellent security systems in operation at the logistics platforms. Our logistics warehouses in Spain are located in Valencia (in Ribarroja and Onteniente), Madrid and Barcelona, and have a total surface area of over 43,000 m2, with a storage capacity of over 55,000 pallets. In Portugal, we have our own warehouses in Alverca (Lisboa) and Maia (Porto), and other refrigerated warehouses of Romeu Group in Sines and Leixoes taht offer a total surface area of over 10.000 m2 with a storage capacity of over 10.000 pallets. And in Cuautitlán, we have a total surface area of over 10.000 m2 with a storage capacity of over 5,000 pallets. You can get information online about your stock in all our warehouses at all times. All of our warehouses are managed using RF technology. This system provides the goods’ status and location at all times by reading their assigned bar code reading. This is also useful to check the origin of the goods and any other information that has been recorded. Ask us about our logistics solutions for storage and distribution, and get tailored advice. Contact us and we will come up with a solution!